Victor Serge (1890–1947) played many parts, as he recounted in his indelible Memoirs of a Revolutionary. The son of anti-czarist exiles in Brussels, Serge was a young anarchist in Paris; a syndicalist rebel in Barcelona; a Bolshevik in Petrograd; a Comintern agent in Central Europe; a comrade of Trotsky's; a friend of writers like Andrei Bely, Boris Pilnyak, and André Breton; a prisoner of Stalin; a dissident Marxist in exile in Mexico . . . A novelist, a literary critic, a political journalist, and a historian of the Russian Revolution, Serge was also a formidable poet. In A Blaze in a Desert: Selected Poems, Victor Serge bears witness to decades of revolutionary upheavals in Europe and the advent of totalitarian rule; many of the poems were written during the "immense shipwreck" of Stalin's ascendancy. In poems datelined Petrograd, Orenburg, Paris, Marseille, the Caribbean, and Mexico, Serge composed elegies for the fallen who, like him, endured prison, exile, and bitter disappointment in the revolutions of the first half of the twentieth century: Night falls, the boat pulls in, stop singing. Exile relights its captive lampson the shore of time. A Blaze in a Desert comprises Victor Serge's sole published book of poetry, Resistance (1938), his unpublished manuscript Messages (1946), and his last poem, "Hands" (1947). Victor Serge (1890–1947) was an anarchist firebrand, who wrote three novels, was arrested, and lived in precarious exile throughout his life. James Brook (translator and editor) is a poet whose translations include works by Guy Debord, Henri Michaux, Gellu Naum, and Benjamin Péret. He is the principal editor of Resisting the Virtual Life (with Iain Boal) and Reclaiming San Francisco (with Chris Carlsson and Nancy J. Peters). The New York Times named his translation of Jean-Patrick Manchette's The Prone Gunman a Notable Book. Richard Greeman (afterword) is the translator of five novels by Victor Serge, including Men in Prison and Birth of Our Power from PM Press. 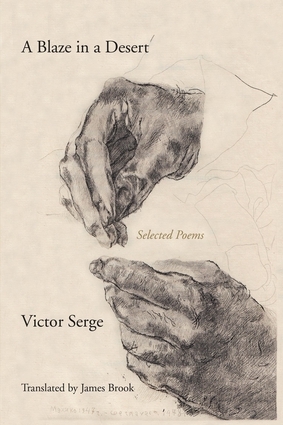 He has published literary, political, and biographical studies of Serge in many languages.